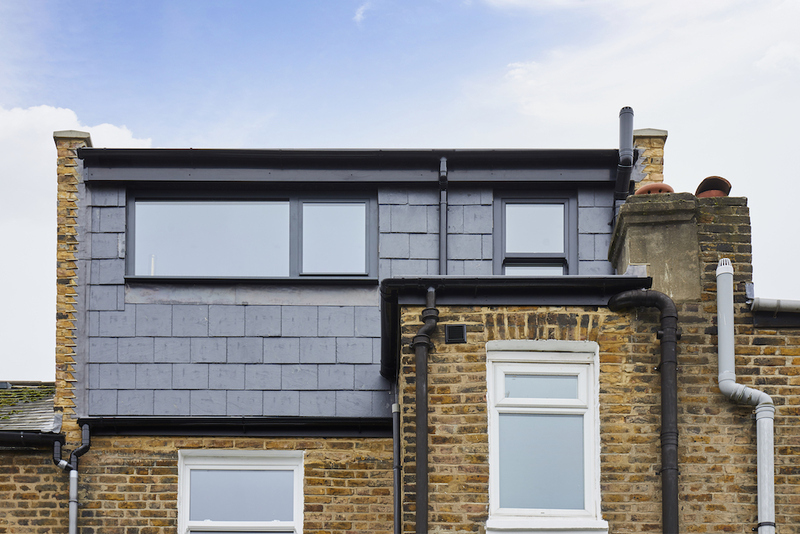 When it comes to adding both new space and value to your home, no project does it better than the loft conversion. However, finding the headroom and space to make this happen can be a challenge for a lot of UK homes. For this reason, you might be considering a dormer - a box shaped structure added onto a pitched roof, creating walls that sit at a 90 degree angle to the floor. These additions are fantastic for adding new space, but many homeowners worry about their dormer becoming an eyesore. No one wants an ugly box stuck to the top of their roof. Not all dormers have to be big. In fact, due to strict planning restrictions in this conservation area, our team designed this dormer to be smaller than your standard model. Yet even with this small addition, we were still able to not only create a bright, and spacious double bedroom, but also a ensuite next door. Creating the ultimate hideaway for older teens, or visiting relatives. On the exterior, we’ve blended many of the elements that give this townhouse its charm. Including a mirrored window design between the loft and the downstairs glazing, and slick grey exterior on the dormer itself to match the tones of the original roof. Learn more about this loft conversion. Looking for plenty of extra space? Then your dormer can certainly provide that too. Check out this second Resi designed property. This substantial dormer has created a large master bedroom, complete with an ensuite to make anyone jealous. The two large windows help bring in that all important natural light, while the grey slate pays homage to the original Victorian tile used in the property’s first incarnation. Here’s another bold design. This large dormer not only adds a huge amount of upstairs space (ideal in London, where this is valued at a premium), but has created something truly spectacular with its use of natural larch wood cladding. Think the wood has been painted that dark colour? Think again. This timber has actually been burnt to achieve this effect. This process not only protects the wood, but adds that almost black colour, and a smooth finish. The horizontal lines blending wonderfully with the opposing brick and tiles next door. If you like to do things a bit differently, don’t think all dormers have to blend in. With a good architect by your side, you can really push the boat out with your design. Take this weathered steel creation, built in East London. This rust coloured cladding will eventually become naturally encrusted and match the red brick and tiles of the surrounding buildings. Yet, until this weathering takes full affect, you can’t deny this bold conversion has style! Like other designs, this still provides a bedroom (or study) complete with ensuite. It also enjoys balcony space, with sliding doors helping to give access, without taking up any unnecessary space. Because of this balcony, and the unique design, this addition would not come under permitted development rights. So if you want something similar, you’ll need a full planning application. Are you surrounding by stunning natural views? Then why not take inspiration from this glazing masterpiece and make the most of them? Based in Shepherd’s Bush, this Victorian townhouse not only has lush, and much sought after garden space, but a small neighbourhood park just behind the property. To take in these stunning views, their designers went with a expansive glazed wall, complete with lined up windows for crisp lines, heavily favoured (and loved) in modern design. The scale of the glazing means this dormer is not for the faint of heart (or small of budget), as it likely required the use of structural glass. However, with such fantastic natural views in a location like London, this is certainly an investment that will pay off when it comes to selling this property. Looking to create a dormer unique to your home? Book in a free consultation with our team and we’ll talk you through everything from design possibilities, timelines, and budget. Did we mention this chat is free? Book yours today.